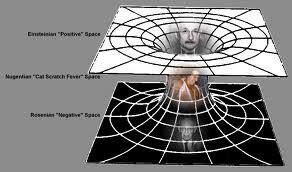 higher dimensions in our lives. narrated series, "Through the Wormhole"
Through the Wormhole explores the deepest mysteries of existence – What are we made of? What was there before the beginning? Are we really alone? Is there a creator? These questions have been pondered by the most exquisite minds of the human race. Through the Wormhole brings together the brightest minds and best ideas from the very edges of science – Astrophysics, Astrobiology, Quantum Mechanics, String Theory, and more – to reveal the extraordinary truth of our Universe. Imagine that you're a science-fiction writer on a tight schedule. You'd like to play in the vast expanses of the universe, but you have too much scientific integrity to conjure up a warp drive or a DeLorean out of thin air. You're also concerned that your audience would get bored in the thousands of years that it would take for a spaceship to realistically travel the distances between stars. What you really need is a wormhole — a shortcut through time and space. Best of all, unlike most science-fiction tropes, wormholes might very well be real. Seventy-five years ago today, Albert Einstein and his collaborator, Nathan Rosen, submitted a paper to the Physical Review with the goal of unifying gravity and electromagnetism. Although they failed to discover a theory of everything, they did something arguably more much important: By creating the first theoretical model of a wormhole, Einstein and Rosen allowed science-fiction writers — including Arthur C. Clarke, Madeleine L'Engle and the writers of "Babylon 5" and "Doctor Who" — to explore vast stretches of space and time in the blink of an eye. 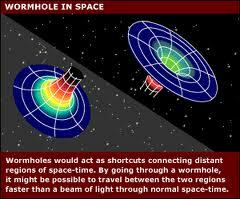 The name wormhole was coined by American theoretical physicist John A. Wheeler in 1957, based on an analogy of how a worm could chew a hole from one end of an apple through the center to the other end, thus creating a "shortcut" through the intervening space.